Click the images to view them in all their glory! Line up of P6's at Bressingham. Kings Lynn Mayor admires P6. Recreated early photo at Norwich Cathedral. 1933 Speed Pilot 14 and 12 Tourer at Bressingham. 45S heads the line up at Bressingham. 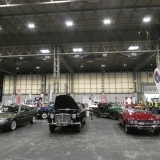 P5 Hearse at NEC Restoration Show March 2019. Team at 2017 NEC Restoration Show. P5b Coupe and P4 at East Anglia Transport Museum. P6 Estate at 2016 P6 National Rockingham Castle. Line up of 75's at Bressingham. Caught enjoying the sun at Bressingham. P6 3500S at 2016 NEC Restoration Show. Club display at Caister Castle Car Museum. Low wing P4 in the parade ring. 2000 75 at Sandringham Charity Day. 825 Coupe at Sandringham Charity Day.